This CD automatically makes you more aware of the portions of food you eat and when you eat them. It will give a desire to eat healthy fresh foods over unhealthy ones. By releasing past negative eating patterns and suggesting new positive ways to be healthy, you will no longer feel like fatty or sugar ridden foods. Instead you'll feel like small portions of healthy food at nominated meal times and also become motivated to exercise daily. You'll also feel more confident with yourself and the people around you making it easy to make these lifestyle changes without anxiety. Improve your diet to a more healthy way of eating. Let Rick guide you through the fundamentals of portion control and correct food choice to ensure these messages remain entrenched in your subconscious thought patterns. Lose weight, exercise daily, eat healthy foods, and become more motivated and confident. 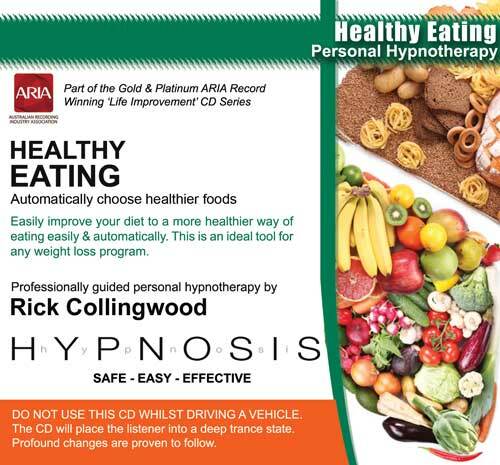 Healthy Eating through Hypnosis is Proven to Assist Weight Loss!